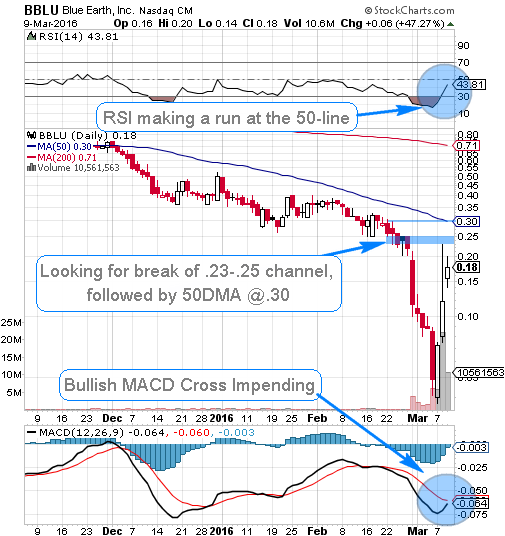 While we most commonly look for short-term, quick-strike trading opportunities, every so often we’ll sneak in a longer-term play, and that’s just what we did on Tuesday of last week with BBLU. As it turns out, we were absolutely spot-on in our assessment of BBLU and how to approach it. After ultimately bottoming out at a low of .04 at the end of last week, the recovery has been a thing of beauty. BBLU caught fire and ran back to a subsequent high of .23, regaining its lost ground just as we suspected. That’s an incredible 475% swing! As we point out on the chart below, things are still looking ripe for yet another leg-up, so we’ll keep a keen eye on BBLU in the sessions ahead. Speaking of bottom-plays, we have a couple of other familiar stocks that are just now trading at their own recent lows, and could be in line for recoveries. We’ve been tagging them in our extended watchlists recently, and we’re going to have them both on a more intensive watch moving forward. We’ll look to further our success with options plays this week with an idea we feel has good potential based on a favorable earnings report. Dollar General, Inc. (DG) is gapping up this morning into the $79-range, so we’re going to be on the lookout for a possible dip-and-rip situation, whereupon we’ll be tracking DG Weekly $78-80.50 Calls for possible daytrade and/or swing trades into tomorrow’s session. UPZS was one of a pair of stocks that we added to our watchlist on Friday that continued to perform well yesterday. We’ve had experience with this play making gains for us in the past as well. We observed a low of .008 in UPZS Friday morning, and yesterday the stock reached a high of .0136. That worked out to a three-session swing of 70% and has come on very high volume. Yesterday’s move brought the stock to within just a few ticks of its 52-week high of .014. We’ll definitely want to keep a lookout for a breach of that price point, which could certainly lead to what we like to call a Blue Sky Breakout. We’ll watch for it to consolidate off of that high and keep our eyes peeled for subsequent rebound opportunities. 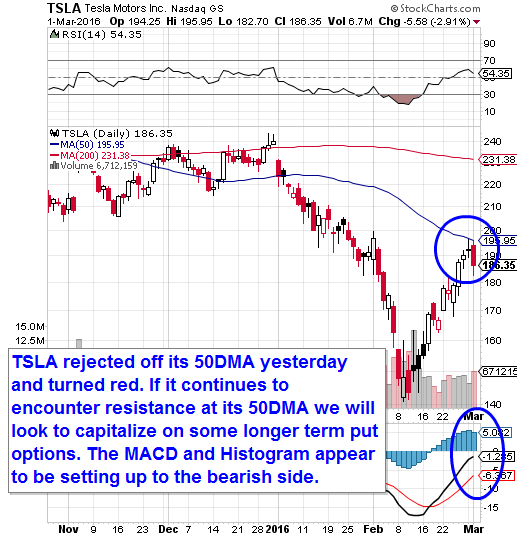 Tesla Motors, Inc. TSLA - As we point out on the chart below, we watched as TSLA rejected off of its 50DMA yesterday and went bearish. We’re going to want to stick close and monitor a couple sets of medium-term plays in the event that an extended backslide occurs in coming sessions. We’re looking at four contracts in particular in this case- TSLA 01/11 and 01/18 $180 and $177.50 Puts. We also want to signal a range of ANF contracts for observation in the wake of this morning’s earnings beat. We’ll look to take advantage of ANF Weekly $29-32 Calls for potential daytrade and intraweek swing-trade opportunities. Yesterday, we had just about the most successful day of 2016 so far in terms of the sheer number of red-hot movers we tagged in our premarket report. We went from the monumental options success of earlier sessions, to spotting some prime opportunities in the stock arena. We let our readers know they could expect “some potential bounceplay action” from AGTK yesterday after we had tracked it over a 100% pop (.003-.006) and subsequent pullback toward the end of the previous session. We got exactly the type of behavior we expected from the stock, as AGTK piled on another excellent performance. The stock traded in a daily range from .0032-.0048 for a solid 50% intraday surge, and unlike the previous day’s activity, it managed to hold a vast majority of the day’s advance into the close. DNRG has appeared in our reports repeatedly in the past and after re-tagging it in yesterday’s watchlist, we were pleased to see the subsequent activity in the stock. 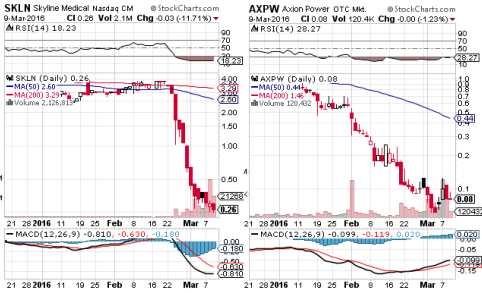 It traded up from a daily low of .024, going to hit .035 for a 46% intraday upswing. Like the aforementioned play, it too demonstrated strength into the market close, ending on its high-of-day and thus qualifying it to remain on our radars as a possible momentum play. No sooner than we got the chance to congratulate readers who caught our alert of PKGM the Friday before last on the amazing run it produced (.0031-.013, +319%), did the stock turn in yet another winning card. Last but not least among our excellent selections from yesterday’s morning report was SPWZ. This was a first-time mention for us, and the stock provided a heck of an introduction! We watched as SPWZ launched from an early low of .25 and ended up at a high of .44 for possible intraday gains up to 76% Like each of the previously mentioned plays, it held a healthy amount of that advance into the close. We took notice of SCTY’s earnings miss today and immediately were struck with a potential options idea. The stock, which has already been under duress all this month, looks set to get kicked once again. The activity is fueling our attraction to the possibilities that could be provided by the SCTY Weekly $19-17 Puts. We’ll throw these up on our tracking board for potential intraday/intraweek swing-trade chances.